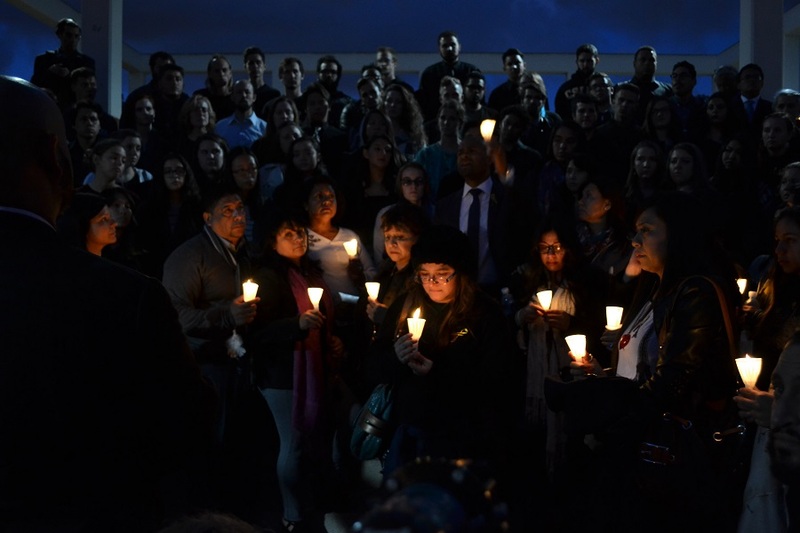 Photo of the Sunday CSULB vigil for Nohemi Gonzalez by Stephanie Rivera. On the heels of an emotional candlelight vigil at Cal State Long Beach (CSULB) on Sunday, the city of Los Angeles and Whittier High School announced they will be holding vigils today for the CSULB student who perished in last Friday’s Paris attacks, which killed at least 129 people. Nohemi Gonzalez, 23, of El Monte, was a junior at CSULB majoring in industrial design. She was studying abroad with 17 other CSULB students in Paris and attending the Strate College of Design as an exchange student before she was shot on Friday at a popular bistro called La Belle Equipe. She was at the restaurant with friends from CSULB, who witnessed the shooting of their friend and her evacuation on a stretcher. They learned she later succumbed to her injuries in the following hours. A vigil will be held at Whittier High School, from which Gonzalez graduated in 2010, at 4:30PM, the school announced on its website and Twitter. Later, at 5:30PM, Los Angeles Mayor Eric Garcetti and French Consul General Christophe Lemoine will lead a vigil that memorializes all victims of the Paris terrorist attacks on the Spring Steps of Los Angeles City Hall, 200 North Spring Street. Gonzalez’s boyfriend of nearly four years, Tim Mraz, called her a firecracker who is in heaven dressing a hundred pugs—her favorite breed of dogs. “She always said I was her John Smith,” Mraz said of Gonzalez on Sunday, who he said had a Pocahantas-inspired armband tattoo. At the vigil, Mraz and a few others were seen wearing feathered bands around their arms. On Monday, a crowdfunding effort was underway to pay for an international study scholarship in Gonzalez’s name. To donate to the Nohemi Gonzalez Fund to Support International Study, click here.